There are, roughly speaking, two different ways of approaching world-building in fantasy storytelling: mythological and anthopological. The mythological approach is easy to find; it’s what almost everybody who writes fantasy, science fantasy, or steampunk does by default. Defining it is a bit trickier, but it generally comes down to one thing. The world is built around the tropes, myths, and themes the writer wants to play with. Now, everybody does this to a degree, even the pretentious unread few who do literary fiction, but fantasy takes it to another level. The worst of them are little more than grab-bags of tropes the writer enjoys, a mixture of ingredients they enjoy, like a moron’s cliché goulash. If the writer’s feeling particularly clever they’ll do a witty twist on a trope, usually by mashing it together with another one. This sort of thing is fun if you’re Alan Moore and have an insane and detailed mastery of all of the tropes and stereotypes you’re playing with. For the rest of us, I think it’s an approach that gets in the way of good storytelling. You pick an important part of the social infrastructure or economy and figure out how it works in your world. You note everything you learn about your world in the process. Then you pick another detail or part and repeat the process. Repeat until the place feels real in your head, like a place you’ve lived in for, at the very least, a few months. 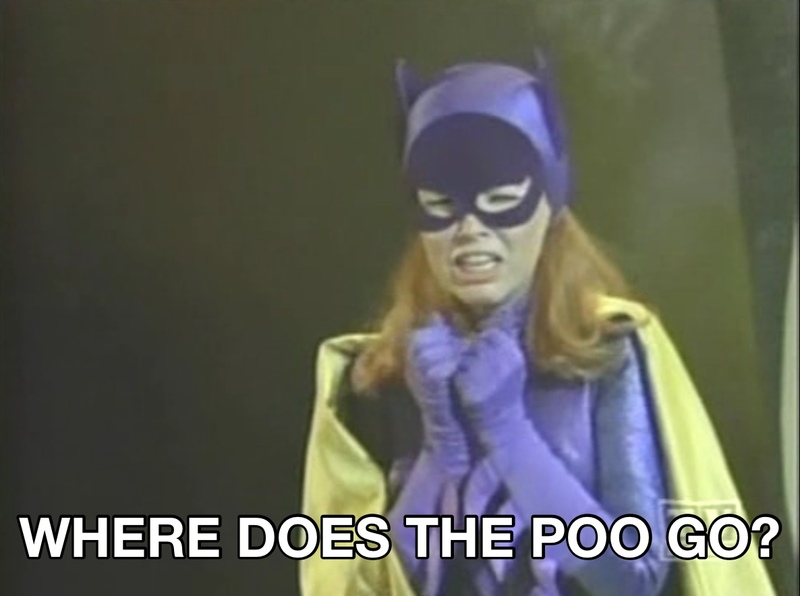 Whenever I see an architecture or city in a fantasy story or movie that clearly is or was jam-packed with inhabitants, one of the first things I worry about is, yes, where does the poo go? Fantasy is full of buildings like towers, with hundreds of inhabitants, so big that a turd tossed out of a chamber pot on the top floor would achieve terminal velocity and nuke the donkey stables below upon landing, scattering hooves and tails and blood-soaked donkey chunks all over the poor peasants who serve the masters in the tower. Well, at least the peasants get an outhouse. The wizards living on the top floor aren’t so lucky. Does the society completely go without a sanitation infrastructure, sewer systems, etc.? That means they’re plagued regularly by typhoid, cholera, and a host of gastric fevers, as well as the bubonic plague (possibly). That also means that the place either stinks to high heaven (the human and dwarf cities) or is soaked with artificial perfumes to drown out the stench of poo (the elves, asthmatics probably have a three minute life expectancy in an elven city, before a semisolid cloud composed of thick perfume and the stench of turd blossoms chokes them to death). Those massive underground cities built by dwarves in every cookie-cutter fantasy? They can’t exist without a sanitation infrastructure. That means they have a large sanitation staff, sewer engineers, etc.. If the city doesn’t have a sanitation infrastructure, it also means that they really don’t know what they’re doing, that they don’t actually understand the magic they’re learning, because if magic was a science that could be researched, that same scientific method is likely to let them discover why everybody dies young in the cities but not in the countryside. (Sanitation, sanitation, sanitation.) Without sanitation and without antibiotics, moving to the city and seeing a doctor is likely to cut your life expectancy dramatically. (Hence the positive role of faith healing and homeopathy before antibiotics. They saved your life by keeping you away from the demented quacks that dominated medicine. Diluted water or being pawed by a deluded preacher is relatively harmless in comparison to the bleeding and the poisons doctors used.) Even if magic does heal gastric fevers, that still leaves out the poor who continue to die in droves because they can’t afford to hire healers (which tells you a little bit more about what sort of society it is). If they do have a sanitation infrastructure, is it based on engineering or magic? Do they have sanitation wizards? Who, if they do, don’t have to appear in your story, but their existence should change the way you portray wizards, forcing you to cut down on the mystery aspect. If it’s based on engineering: where do the engineers come from? Is it an apprentice-based system like the bridge-builder and his apprentices? Does the society have colleges? Universities? If you have engineering then you probably have mathematics as well which tells us that bit more about the society. Also, how this infrastructure came to be tells you a lot about how your society is structured. Was it an automatic, self-running, infrastructure created by a group of all-powerful wizards as a voluntary gesture? (It’s an oligarchy.) Was it done as a civic engineering project and paid for by taxes? (Probably a democracy, or at least a parliamentary monarchy.) Was it done on the king’s orders, by his engineers or wizards? (Benevolent dictatorship. One where the king has the greedy self-centred upper class under control. Also probably not at war at the time.) The existence of sanitation or not also tells you whether labour is cheap, replaceable, and unskilled (why bother with sanitation, who cares if they die?) or educated, unionised (or do they call them guilds in fantasy? ), and with political clout. I’m not saying you should mention any of this in your story. You could write your entire epic without ever mentioning toilets, sewers, or turds, if you want to (why wouldn’t you want to do that? crazy). All I’m saying is that you think about it, how it works, because picking at the sanitation problem forces you to think about how the society works as a whole, how everything hangs together, about the power-structures in place, the class structure, the education infrastructure, and the economy.